Take a day to check out one of San Francisco’s top Attractions and try out some delicious food in San Francisco’s North Beach neighborhood with the Alcatraz and North Beach Food Tour. Voted one of the ten “Great Neighborhoods of America,” San Francisco’s North Beach is located in the northeast section of the city, near Fisherman’s Wharf, Chinatown, Russian Hill and the Financial District. Home to iconic landmarks like Coit Tower, City Lights Bookstore, Vesuvius Cafe, Jack Kerouac Alley and Cafe Trieste, North beach is rich with restaurants, bars, cafes and interesting local shops. The North Beach Food Tour will take you through North Beach to 3 hand-picked local restaurants to give you a taste of the neighborhood flavor. The tour guide will give you a healthy dose of interesting facts about the historic neighborhood along the way. First, you will board a luxury minibus from our convenient Fisherman’s Wharf location and head to the first of 3 amazing North Beach restaurants, where you will try some light bites and learn some interesting San Francisco History. At the end of the food tour, you will hop back on the bus and head to Pier 33 and board the ferry to Alcatraz! 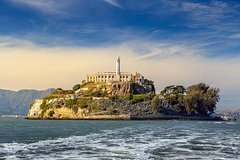 The former Federal Penitentiary and former home to Al Capone, The “Birman of Alcatraz” and other famous criminals is just a short ferry ride away. Check out the main cell house, The Lighthouse, Former Dining Hall, Rec yard and the infamous Building 64 as you follow the audio tour. After the audio tour, walk freely through the grounds to see the unique birds and foliage, remains from the fire and awesome views of San Francisco.